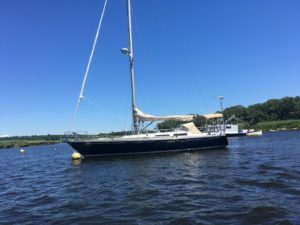 Further on her summer mooring in Newburyport. Can’t you see she’s rarin’ to go?! C’mon! 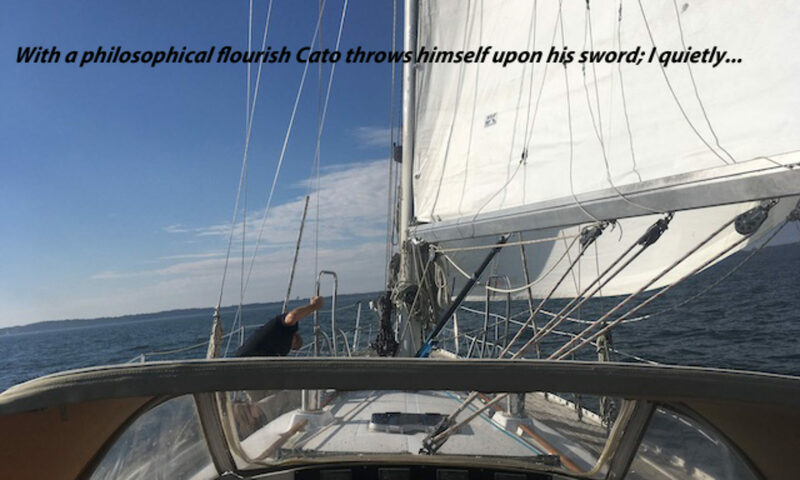 Greetings, Sailing Friends and New Englanders! As you may have heard, Further made it home to Plum Island. 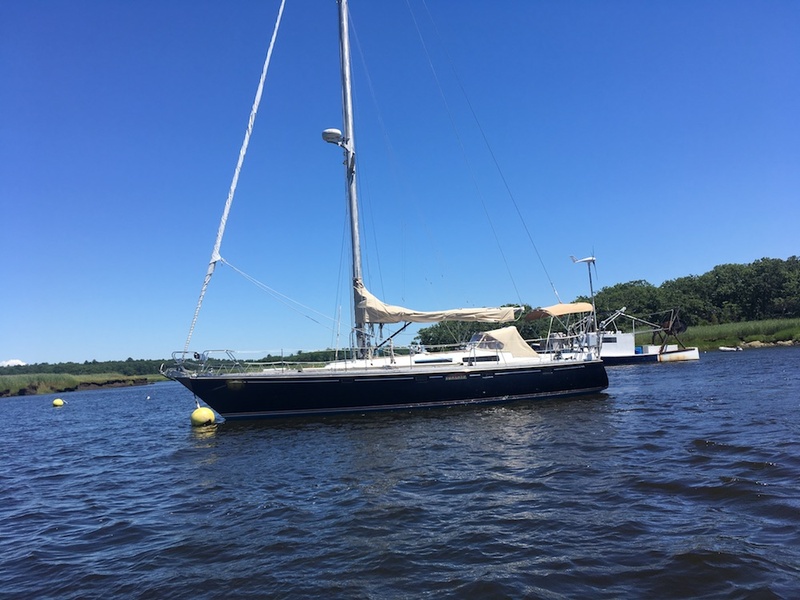 She excelled under both sail and power in the 95-hour journey (including an overnight at Block Island) from Annapolis (details on the journey coming forthwith in a separate post) and is comfortably moored on the Merrimack River in nearby Newburyport. Hey, she’s already had a couple of fun jaunts on the neighboring sea. But it’s high summer on the North Atlantic and that means it’s time to make hay while the sun shines. Further’s champing at the bit and I’m eager to see her happy. There’s only one problem: I can’t do it alone. Not yet, anyway. One of the ironic twists of this ongoing gong show is the fact that, while the water level in my cove in Annapolis might have been so low at times as to preclude my leaving the dock, the water was, also, very calm back there in said cove, so I could get in and out of the dock by myself. As long as there was water I could take Further out. On the Merrimack there’s plenty of water. In fact, there’s all the water pouring down from the White Mountains of New Hampshire and heading out to sea, and that makes for some pretty quick currents. The currents are not a big deal—except when you’re trying to pick up a mooring ball among a slew of other boats secured to identical nearby mooring balls. That’s where you come in. Who wants to go sailing? C’mon down! We can head out for a couple of hours of running back and forth off the beaches at Plum Island and Salisbury, Mass. Let’s head to the Isles of Shoals and pick up a mooring (probably limited to weekdays) for lunch. Let’s head out in the late afternoon and float around overnight under the August full moon (early morning on Sunday, 26 August so let’s go Saturday night the 25th). Hell, how about a multi-day trip to Maine? I’m game. And so is Further. So shoot me an email, send me a text message, launch a carrier pigeon—let me know you want to go and are able to go. Enthusiasm is more important than ability; I can teach you a lot of the basics. All you have to be able to do, really, is grab a little buoy with a boat hook as we come back to the mooring and hold on to the line attached to it long enough for me to run forward and secure the boat. (It sounds harder than it is.) If you can do that, we’re good to go.